Teaching a large class poses many challenges, both in and out of the classroom. In the classroom, large enrollments can promote student disengagement and feelings of alienation, which can erode students’ sense of responsibility and lead to behaviors that both reflect and promote lack of engagement. Logistics can also be a challenge when teaching a large class. How does one best manage the daily administration of what can often feel like a small city? What causes students to not participate? While encouraging class participation can be challenging in any class, it can be especially difficult for instructors of large classes. To effectively evoke participation in such teaching contexts, it is helpful to understand the factors that discourage involvement. In the article, “Putting the Participation Puzzle Together,” Dr. Maryellen Weimer attempts to uncover precisely what motivates students to be active participants in the classroom. Weimer does this by analyzing a recent study that tests common hypotheses about the nature of student participation. The study found that while a multitude of issues affect student participation levels, a few emerge as particularly important. First, students’ perception of faculty authority can make a substantial difference in determining whether or not students participate. Second, students’ perceptions of the instructor, developed through interactions outside of the class, have a large impact on student participation. Finally, student fears of peer judgment explain why many students choose not to participate. The issue of faculty authority requires particular attention. In our often freshmen-heavy large classes, many students feel that the instructor is the arbiter of knowledge. To these students, the ideas and arguments of the instructor are not meant to be challenged. Certainly, students like this are more likely to sit silently in class and take it all in. If, as instructors, we hope to avoid this, we must make sure that our courses are content-centered, not instructor-centered. How does one do this? We can model the kind of questioning inherent in our disciplines and ask students to practice those questioning skills through exercises, in-class and out. We can also be careful to underscore the degree to which knowledge in our fields is contested and constantly evolving. To allow students to practice the skills they should develop, it can be helpful to break up the class into 10-20 minute segments, incorporating a specific question or exercise that requires student participation in each segment. The question or exercise can take several forms. Think-pair-share – In this simple exercise, the instructor poses a question or problem to the class. After giving students time to consider their response (think), the students are asked to partner with another student to discuss their responses (pair). Pairs of students can then be asked to report their conclusions and reasoning to the larger group, which can be used as a starting point to promote discussion in the class as a whole (Angelo and Cross, 1993). This exercise helps promote engagement because students feel greater responsibility for participation when paired with one other student; lack of participation becomes obvious and problematic. In addition, the inclusion of “think” time and the initial opportunity to talk about a response with a single peer reduces the anxiety some students feel about responding to instructor prompts. Minute paper – This classroom assessment technique (Classroom Assessment Technique Teaching Guide) can also be used to promote student engagement (Angelo and Cross, 1993). At the end of a class segment, students are asked to spend one to three minutes writing the main point of the class to that point as well as questions that remain. These papers can serve multiple purposes: they can be used by the instructor as a formative assessment technique; they serve as a tool to promote metacognition, asking students to consider what they do and don’t understand; they can be used as the basis for small or large group discussion. As with the think-pair-share technique, the minute paper gives students time to compose and articulate their thoughts, increasing their comfort with asking questions or entering discussion. Muddiest point paper – This modified version of the minute paper asks students to articulate the point that is most unclear to them at a given point (Angelo and Cross, 1993). It serves the same functions as has the same potential uses described for the minute paper. 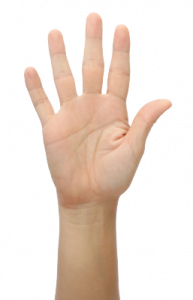 Clicker questions – Questions that can be presented as multiple choice questions are particularly amenable to use with “clickers,” or classroom response systems. All students in the class are asked to choose a response to the question, and the results can be displayed in real time. If the instructor wishes, student responses can be tracked, either to serve as an attendance measure or as a formative assessment tool. This approach has the benefit of broad student participation in the mental work of answering the question. In addition, clicker questions can be used to foster discussion very effectively (Crouch and Mazur, 2001); if a significant fraction of the class answers incorrectly, then student groups can be asked to discuss before re-voting. When planning these questions or activities, keep in mind that large classes present advantages as well as special challenges. In these large classes, think of students as a diverse human resource to be drawn upon in pursuit of our learning goals. To help ensure that the students serve as this resource, it is vital that we set the right tone from the beginning. Make it clear during the first weeks of class that we expect students to question us and interact during class, and introduce questions or exercises that make that interaction both expected and safe. These approaches are particularly effective when they take advantage of the opportunity for small-group work. 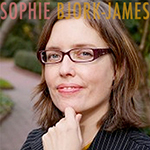 Studies suggest that small-group activities promote student mastery of material, enhance critical thinking skills, provide rapid feedback for the instructor, and facilitate the development of affective dimensions in students, such as students’ sense of self-efficacy and learner empowerment (Cooper and Robinson, 2001). Assigning group members roles (like facilitator, recorder, divergent thinker, etc.) or distributing a group assessment rubric can keep groups relatively balanced and fair and help ensure participation by all group members. Student perceptions of the instructor can be particularly challenging to deal with given that in large classes, it is more difficult to have meaningful exchanges with each and every student. However, there is much that we can do to project a demeanor that promotes student participation. Make it a priority to learn and use student names. Some instructors use “equity cards”, which are generated from students’ pictures (from the class roll). Instructors call on people at random from the card pile. This ensures that the instructor uses students’ names, helps ensure a broad base of participation, makes students less likely to disengage during class, and can be a helpful tool in learning students’ names. Other instructors accomplish the same goals by gathering student ID cards at the beginning of class and choosing students at random to answer questions. Establish a rapport. At the beginning of each semester, Andy Van Schaack of the HOD department at Vanderbilt asks students to fill out note cards describing some of their interests. By looking over these note cards and memorizing student names, Dr. Van Schaack gets to know his students and tries to greet them by name and speak with them as they enter the classroom. Such efforts often result in a better rapport between professor and student, and as a consequence, a more engaged classroom. Be patient and affirmative with students in class and out. These behaviors can bolster student confidence, and more confident students are much more likely to participate in class. Many students will shut down in a class when they perceive an instructor as harsh. In such cases, the fear of instructor disapproval becomes more pronounced. Develop strategies to encourage students to use office hours. Dr. Andy Van Schaack requires studentsrequires students to meet with him in groups of four during the first few weeks of the semester. He finds that the brief social interaction (generally, about 5 minutes per student) helps him remember students’ names and makes the students more comfortable with him and a small group of their colleagues. Fear of peer judgment is a disincentive for many students, particularly in large classes where students fear being embarrassed in front of dozens or even hundreds of their peers. To best deal with student fears of peer judgment, it’s critical that instructors promote an environment of trust and mutual respect from the very beginning of a course. In such an environment, students are more likely to feel safe to actively participate in class. Try to foster a sense of personal connection between students and instructors through group and partner activities that help students get better acquainted. The resulting feelings of cohesiveness are especially valuable because students who feel that connection are far less likely to go against their classroom community’s norms. Finally, be sure to balance student voices by not allowing any students to dominate discussions and by protecting students from interruption. All of the approaches described above allow students the opportunity to engage with class questions and challenges anonymously or in small groups instead of or prior to large class discussion. These tools can therefore reduce student fears and thereby promote participation. In addition, online discussion boards can provide structured opportunities for students who are otherwise too shy to participate in class discussion. Large courses come with grading problems familiar to instructors across a range of disciplines. On the one hand, we don’t want to have so many graded assignments that we bog ourselves down with incessant grading. On the other, we do want to have enough assessments that we have a fair grading system for our students and ourselves. Is there a way to strike a balance between these two things without relying entirely upon multiple choice exercises? Absolutely. There are several ways to incorporate more formative assessments into our class that do not add significantly to our workload, but give students and instructors the critical feedback that they need. Discussion-oriented activities in the classroom enable students to practice course-related skills and demonstrate comprehension of the material, while not requiring formal grading. For these kinds of activities, students can receive valuable verbal (and sometimes written) feedback from professors, TAs, and other students. The incorporation of polling technologies like “clickers” or Top Hat can also serve to engage students while giving students a sense of how they’re doing in the course, and giving instructors an opportunity to assess student-learning. These types of feedback-providing activities are especially valuable in classes in which the first graded assignments are not returned to students for several weeks. Assigning each member of the group a role in the group. Building a peer review element into the group work so students feel accountable to one another. Offering small bonuses on exams for those groups whose members all maintained a certain average, in order to promote positive interdependence. Another way to build a steadier stream of graded feedback into our courses without making grading a full-time job is to maintain a simple grading system for short assignments. For example, we can grade papers on a three-to-five point scale, with specific pieces of information required for each point. A check/check-minus/check-plus system also makes our job as a grader quicker and easier while providing feedback to instructor and student alike. It’s important to realize that we need not grade everything on a 100-point scale with copious comments. Finally, by utilizing a detailed grading rubric for papers and other assignments, we can streamline the grading process and reduce the need for extensive written comments. Rubrics can also obviate problems of inconsistency when we’re dealing with more than one TA grader. Effective rubrics can thus facilitate a faster grading system that is also fairer for students. One of the most time-consuming aspects of grading in any classroom is providing comments on student papers. How do we provide worthwhile comments to students while protecting our time? There are a few ways to approach this problem. Many professors use shorthand comments on papers and hand back papers with a guide to that shorthand. Indeed, often we make the same comments over and over again on many papers. Rather than repeating those comments in full sentences, a shorthand comment of perhaps a word or acronym, keyed to a guide can save considerable time for professors. That’s not to say either that all comments should be “cookie-cutter” in this way, but using this technique for half of one’s written comments can shave hours off the grading process. For more information on such shorthand paper feedback, please see a recent Professor Pedagogy post, entitled, “A Mountain of Grading,” which discusses a CFT workshop from August 21st, 2012, “Effective and Efficient Grading,” led by Assistant Director Nancy Chick, and Graduate Teaching Fellow Beth Koontz. A series of case studies on the utility of the system can be found here. Many science textbook publishers offer similar systems; instructors should consider these systems when choosing a textbook. ALEKS is a textbook-independent assessment and learning system that relies upon artificial intelligence techniques to assess students’ understanding of key course concepts and track them to learning activities that help move their understanding forward. Built on the principle of hierarchical concept organization in chemistry and math, the system asks students diagnostic questions to locate their areas of mastery and then tailors subsequent steps to build on existing knowledge. This list, while far from exhaustive, is intended to suggest starting points for online tools that may improve learning in large classes. Another common challenge for instructors teaching large classes is the management of graduate teaching assistants. These teaching assistants are often tasked with grading in large classes, but they come to that activity with vastly different conceptions of what effective grading looks like and how one can grade effectively in a reasonable amount of time. Likewise, teaching assistants come to our classes with different teaching skill sets and life experiences. Some of them are mature, effective teachers, while others are preparing to teach their first class. In our large classes, these issues are often amplified by the large number of TAs that we may require. How do we ensure that our TAs are all on the same page and doing their jobs well? One common undergraduate complaint in large classes is with regard to inconsistency in grading. Most instructors will recognize the refrain, “My TA is an unfair grader! Can I change sections?” Indeed, it can be frustrating for undergraduates who believe that they are the victim of the “tough grader,” and are receiving worse grades than their friends despite handing in comparable work. So how do we ensure consistency and mitigate undergraduate charges of unfairness? Have regular grading meetings! The best way to promote grading consistency among our TAs is to meet as a group soon after collecting an exam or paper. If one is grading essays, identify and photocopy an exemplary essay, a few mediocre essays, and a poor essay and distribute these essays to each member of the group. Prior to the meeting, have each TA grade and comment upon these essays. At the meeting, go through each essay one-by-one. Ask each person what grade they gave to each essay and why. Ask them about the best and worst aspects of each piece of writing. Such a meeting provides a wonderful opportunity for our graders, especially our inexperienced graders, to think about how they’re approaching their grading. It can serve to calibrate expectations for the exam or paper. The meeting can also serve as a forum for us to explain our expectations for the exams or papers. It is unfair to assume that our TAs will simply know what we’re looking for on any given exam question or paper topic. Use grading rubrics. A carefully designed grading rubric can both minimize the amount of time spent grading, an important consideration in large classes, and serve as a common standard for our TAs. We can even enlist TA support in constructing a grading rubric. Such an exercise can be valuable to TAs because it facilitates the grading process, but it also gives them an opportunity to play a major role in student assessment, a valuable experience for those TAs who hope to teach courses of their own at some future time. It also gives us a new and unique perspective on class exams, papers, and assignments that may ultimately enrich the course. Divide up grading sections. We can better ensure consistency by assigning different grading sections to different TAs. This is more challenging with essays, but is a common approach for exam-grading. 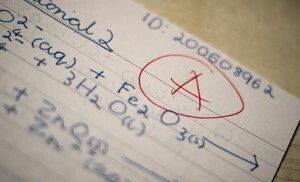 What this technique entails specifically depends on the makeup of our exam, but for example, perhaps one TA grades the short-answer section, a second TA grades the first essay, and a third TA grades the second essay. While there still may be some inconsistency in the “harshness” of grading between sections, with this method, students can hardly argue that their particular grader is tougher: everyone’s exam is graded by the same graders! In most classes, large or small, grade complaints are inevitable. However, the issue can become more pronounced when a couple of upset students becomes a dozen or more. How can we best deal with grading complaints? Have a formalized system in place. Instructors of large classes approach grade complaints in a variety of ways. Some insist that undergraduates come directly to them with their concerns. Others suggest that undergraduates speak to their TAs first before consulting the professor. Still others give full authority to their TAs to handle all grade complaints. 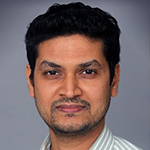 The important thing is that we have a formalized system, preferably outlined in our syllabus. Students should know what is expected of them, and what their options are if they feel that they have been graded unfairly. Tell students upfront what the protocol will be. Require complaints to be written out and submitted. One common technique to avoid frivolous grade complaints is requiring a written explanation of the complaint at an early stage in our protocol. Oftentimes, upon starting this piece of writing, undergraduates with a visceral reaction to a bad grade will see that the grade was deserved. By requiring this piece of writing, we’re also forcing students to confront the written comments on their exam or paper. Sometimes, students simply see the bad mark and seek out the instructor, rather than reading and mulling over grader comments. Institute a 24-hour rule. Another way to ensure that students are carefully considering the grade and comments and aren’t simply going with a visceral reaction is to have a 24-hour rule. What that means is that students are required to take 24-hours before contacting the TA or professor with a grade complaint. This 24-hour period often serves as a “cooling off” period in which students can read and think about grader comments. Know Your TAs. Just as with grading, TAs come to discussion-leading with different levels of expertise. Some will be at home in the classroom. Others will be terrified to speak in front of their students. It’s a good idea to get a gauge on this in the weeks preceding the semester so that we can give our TAs the appropriate level of support. Some may be independent-minded and will desire considerable control over what happens in their classrooms, and others may require strong guidance. Thus, before we get to know our undergraduates, we ought to get to know our TAs. Hold regular meetings. Should we have TAs that require a strong support system or even if we don’t and we want to maintain some control over discussions, lab sessions, and review sessions, regular weekly or bi-weekly meetings can be valuable. These meetings can serve many purposes. 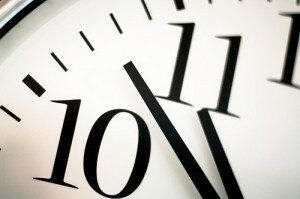 We can use this time to go over important concepts and course content with our TAs who likely don’t have our expertise. We can also use this time as a “check-in” period to get a sense of how the course is going for our TAs and undergraduates alike. Professor/TA meetings can also be a forum in which we provide TAs with handouts or discussion guides to help facilitate their class time. Ultimately, how much control we want to exert over our discussion sections, lab sessions, or review sessions is up to us, but setting aside a time to meet with our TAs is valuable because it provides professor and TA alike with a support structure in which everyone can talk through issues relating to the class. Cheating is a common problem in college courses big and small, but in large courses, it can be particularly difficult to identify cheating when it happens. That’s because we’re grading such a high volume of exams, essays, and assignments that the kind of careful analysis often necessary to identify cheaters is more difficult. We might not know our students and their work as well, and it’s that knowledge that typically helps college instructors identify cheating when it is going on. As anyone who has proctored an exam for 100+ students can attest, it can be very difficult to keep up with everything that’s going on in our small city-sized courses. So what can we do? Be upfront with our expectations. Having been to graduate school, the average college instructor is well-versed in what “plagiarism” entails. Nevertheless, not a year goes by without a professor at a major American university being accused of plagiarism. Certainly, sometimes it’s deliberate. Oftentimes it’s not. That’s because what constitutes things like “plagiarism” and “cheating” is not always clear to many of higher education’s professional academics. Given that fact, the students in our often freshmen-heavy large courses are even less clear on what we mean when we speak of these concepts. Sure, our students may have read the Vanderbilt Honor Code at some point in the distant past, but while they are likely familiar with black and white scenarios (copying answers off of their neighbor’s exam is cheating), do they know what constitutes an honor code violation in those grey and murky scenarios that sometimes confront them? What are our expectations for “open book” exams? If students are allowed to work on homework assignments in pairs or groups, are they allowed to hand in comparable or identical assignments? How do we want students to cite sources in their papers? Is a works cited page required? As the instructor, we need to anticipate such questions. Upon handing out a paper or homework assignment, we ought to have a conversation with students about our expectations. Ideally, we should put those expectations in writing on the syllabus or handout sheet, so that students have something to which they can frequently refer. Putting those expectations in writing also helps should we ever need to charge a student with an Honor Code violation to the Honor Council. Some instructors even choose to dedicate early class time to giving their students a tutorial on cheating and plagiarism. Trying to catch an individual or a small group of cheaters in an exam of 100+ students can be a difficult task, but there’s a lot that we can do to make cheating more difficult. Proctoring effectively. Proctoring can seem basic: watch the students as they take the exam and make sure they’re not chatting or looking at one another’s tests. However, there are some aspects to proctoring that are easily overlooked. For example, it can be difficult to observe students when they are wearing a hat that covers their eyes, so many professors require that students either remove their hats, or put their hats on backwards. Another often overlooked feature of proctoring is the need for at least two proctors. Part of the proctor’s role is often to field student questions regarding the exam, but while the instructor is answering that question, who is observing the students? Randomize the blue books. In many of our large classes, students use blue books for exams. Students are typically asked to bring these blue books with them to class on exam day, especially in large classes where the instructor would have to pay a considerable amount of money to provide all students with exam booklets. Some students see this as an easy way to cheat: write answers in the blue book and refer to those answers throughout the exam period. Of course, there is an easy way around this problem. Ask students to hand in their blue books as they walk in the classroom. Shuffle the blue books, and then re-distribute them to students randomly. Randomize the exams. Perhaps the most traditional way to cheat on an exam is for a student to copy off of his or her neighbor. The easiest way to avoid this is to hand out different versions of the exam. Some professors hand these exams out on different color sheets of paper to further confuse a student who might like to copy his or her neighbor’s exam. Randomize the seating. In our teeming large classes, it isn’t always possible to leave spaces in-between each exam-taker. We can, however, shake up the seating arrangement. For example, one common technique is to require students seated in the back few rows to switch with those students seated in the front few rows. This can prove logistically challenging with a large class and a limited amount of time, but if we have a couple of minutes to shake the students up, it can do a lot to prevent exam takers from cheating. Switch up our exams each semester. Designing tests can be a time-consuming affair. For that reason, some instructors use the same test questions year after year. While this is tempting, it is not advisable if we hope to prevent cheating. Some fraternity and sorority houses, in particular, keep files of past exams for a variety of courses. Change exam questions up each semester to prevent some students from having an unfair advantage. 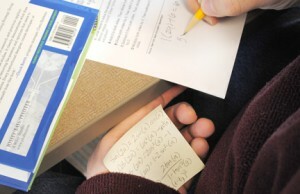 Identifying cheating on papers often requires knowledge of a student’s writing abilities. It’s often when students who really struggle with writing hand in flawless masterpieces that instructors are tipped off to a student’s dishonest tactics. In large classes, we may not have as good of a sense of our students and their writing, so what can we do to stop plagiarism? Provide students with clear instructions. Many of our students are inexperienced when it comes to citing sources. How do we want them to cite their sources? How thoroughly? Will parenthetical citations suffice? What citation style is preferable? Do we require a bibliography or works cited page? Answer these questions in a handout or in the syllabus. Use Turnitin. Brightspace allows users to choose whether or not to run student assignments through “Turnitin,” a program that checks for plagiarism, generates feedback for students on revision strategies, and serves as an online platform for instructors to provide electronic feedback to students. To use Turnitin, instructors must select the option to “enable Turnitin” for each individual assignment that they would like to run through Turnitin. Learn how. So we caught a student cheating. Now what? There are a number of ways that we can approach an Honor Code violation. Take the issue to the honor council. Simply visit the Vanderbilt Honor Council’s page (Vanderbilt Honor Council) and click “Report a Violation.” There are many advantages to this option. The Vanderbilt Honor Council has vast experience dealing with violations and handing the issue over to them takes what can be a substantial weight off our shoulders. Meet with the student. Once one turns the issue over to the Honor Council, one should not discuss the incident with the student. Before one goes to the Honor Council, however, meeting with the student and asking them about what happened can be valuable. Students often appreciate the opportunity to discuss the alleged violation and such a meeting provides the instructor with an opportunity to access the veracity of the student’s claims. Sometimes the issue is simply a miscommunication or misunderstanding. If that’s the case, it’s better to avoid triggering the Honor Council process, which is often long and involved for the student. Ask the student to re-do the exam, paper, or assignment. It is within our rights as the instructor to ask students to re-do an assignment if the violation is minor. It is, however, strongly discouraged to simply give the student a zero on the exam, paper, or assignment. The student may file a complaint against us if they’re denied any kind of due process in an accusation of cheating. Our large courses come with an array of logistical issues that can turn into a nightmare if we are not prepared to handle them. How do we prevent our e-mail boxes from overflowing with student e-mails the 24 hours before an exam? How do we manage that line that sometimes develops around the building during our office hours? 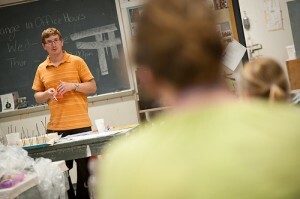 While many instructors do not take class attendance in their large classes, some do. But how can one best take attendance in a class of 200 students? Certainly, many instructors rely upon a attendance sheet that is passed around the room, but this is often a headache with the sheet being lost or students signing in for one another. Many instructors take attendance through the use of clickers. Brief in-class assignments or quizzes can also be valuable in taking attendance. One can require that students answer a class day-related prompt on a notecard at the end of class, sign it, and hand it in before leaving. This notecard can be graded or not. Another way to ensure that class attendance remains high is by giving pop quizzes periodically. When we teach a seminar class, we can expect a small percentage of students to e-mail us regarding the coming exam the 24-hours preceding it. When we have 100+ students, however, that same small percentage can overwhelm our e-mail box. What can we do? Be upfront about how often we will check and answer student e-mails. Our undergraduate students have grown up in an age of e-mail in which many of them expect immediate responses to their e-mailed questions, big or small. This, however, is an unreasonable expectation for those of us not attached to our smart phones, and even for some of us who are, and students need to be made aware of this early on in the semester. Many instructors discuss their rules for e-mail in their syllabus. For example, “I will read and respond to student e-mails once per day, each morning” or “Please give me 24 hours to respond to each e-mail.” Such rules can help avoid rapid-fire e-mails from students, many of which may ask why it’s taking so long for us to respond to their question. Students will also be more inclined to think ahead with their questions and concerns: the professor will not get back to students immediately just because they waited until the last minute on a given assignment. Consider placing limits on student e-mails. Some instructors give students a line or word limit for their e-mails. Some suggest that students keep emails to four lines or less, while others have more stringent requirements. Andrew Van Schaack, Assistant Professor of the Practice in Human and Organizational Development at Vanderbilt, limits the body of student emails to 140 characters, the length of a Tweet. Such rules help ensure that student e-mail is clear and concise. Establish rules about the kinds of questions we will respond to via e-mail. Some questions lend themselves to quick e-mailed responses, others don’t. It may be valuable to tell students what kinds of questions we will answer via e-mail and which are better left for office hours or in-class Q&As. Avoid the pre-exam e-mail deluge. The 24 hours prior to an exam is often a time when panicked e-mails flood into instructor inboxes. Likewise, the 24 hours prior to a paper due date is also a busy time, as students often scramble for extensions. Again, clarity with expectations is important. One ought to notify students when one will stop responding to e-mails regarding the exam, whether it’s 24 hours, 12 hours, or 2 hours in advance, and how long one requires to provide feedback on a rough draft of a paper. Clear and consistent rules can be helpful and may encourage students to think ahead. Create an office hour sign-up sheet. Being an instructor of a large course sometimes means managing dozens of eager office hour visitors each week. However, having students mill around outside our office during our office hours isn’t only a nuisance for our office neighbors, it’s not a valuable use of our students’ time. Consider implementing a formal scheduling system for our office hours, perhaps one publicly available to our students such as Scheduly, so they know when they ought to plan their visit. Encourage students to utilize their TAs. TAs are capable of handling many student issues, and there are some issues for which our TAs are actually better suited than instructors (for example, for discussion section questions or lab questions). Make sure that our TAs are available for office hours and encourage students to visit TAs with their issues, particularly when we are unavailable or otherwise too busy. Lay some ground rules. Sometimes, in the days preceding an exam, in particular, students will visit our office hours expecting to hold an hour-long one-on-one study session. This could certainly be valuable for the student, but can we manage such a session given the time constraints that come with being an instructor of a large class? If the answer is no, we may want to organize a dedicated review session or simply tell students in advance that we cannot be their “study buddy.” Other times students may come by to chat. While there is value in cultivating cordial relationships with our students, if this is not something that we can abide in our schedule, instruct students to only drop by office hours if they have specific questions. Re-conceptualize our office hours. Office hours tend to be one-on-one meetings with students. However, there are some situations in which meeting with students in a group can be just as effective and a time-saver as well. Do three students want to meet with us regarding the makeup of the exam? Assure that they’re comfortable meeting as a group, and then schedule them together. Consider holding online office hours. If our schedules make fulfilling our weekly office hours difficult, or if we are interested in holding extra office hours in a given week, we can always hold remote office hours. If we are interested in conducting office hours online, Brightspace provides a mechanism to do so. The virtual classroom feature lets you live-broadcast and collaborate with students online. Brightspace – There’s a great deal that we can do with Brightspace to organize and maintain our large classes, and even advance our learning goals. Certainly, we can use the service to distribute course content like readings and syllabi. We can use the grade center to keep track of student grades. We can also use Brightspace to conduct office hours online through it’s virtual classroom function, as discussed in the “Managing Logistical Issues” section of this guide. However, one of the most useful features of Brightspace is also among the least utilized: the discussion board feature. Integrating an online discussion board into the classroom experience is a great way to provide structured opportunities for our quieter students to participate in the course. While this is a valuable tool in small courses, it’s particularly valuable in large courses because so many students might have wonderful things to contribute, yet receive comparatively fewer opportunities to do so as one of many students. Consider posing online discussion questions before lessons to get students thinking about the material before class, or asking students to respond to discussion questions after class to demonstrate their synthesis of the material. Twitter – Many university professors have utilized Twitter in their classrooms to great effect. Perhaps the most well-known example of this is Dr. Monica Rankin’s “Twitter Experiment” in her introductory history class at UT Dallas. In this course, Rankin lectures on Monday and Wednesday, and organizes a small group discussion on Friday in which Twitter is used as a backchannel where students share questions and ideas between groups. You can find an excellent five-minute video on Dr. Rankin’s “Twitter Experiment” here: The Twitter Experiment – Twitter in the Classroom. 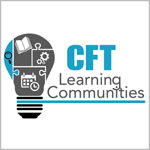 For a brief, critical discussion of Dr. Rankin’s use of twitter, you can find a good article on CFT Director Derek Bruff’s “Agile Learning” blog here: Backchannel via Twitter. Clickers – As discussed in the “Promoting Student Engagement” section, classroom response systems or “clickers” are a great way to get students involved in classroom discussions. One popular technique is to pose a question, ask students to consult their classroom neighbor, ask them to submit their answer as a pair, and then ask some students to share out their responses. Top Hat – Clickers can be a wonderful classroom resource, but they’re not without their problems. The biggest problem for many is that they’re not free, and they’re not even cheap. Top Hat is a “bring your own device” (BYOD) classroom response system that makes use of students’ personal mobile devices (phones, tablets, laptops) as response devices. BYOD systems offer a number of logistical and pedagogical advantages over traditional, “clicker”-based systems. 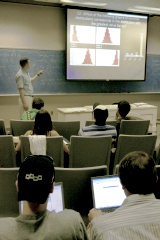 Top Hat is the first classroom response system to be adopted campus-wide at Vanderbilt. It is available to faculty, students, and staff across campus at no cost. Instructors teaching with “clickers” are invited to consider Top Hat for in-class student polling. VoiceThread.com – Another tool that can be used to promote learning in a large class is found at VoiceThread.com. With VoiceThread, we can post an image, document, or video online and have our students comment on it. Students can add a video comment, audio comment, or a text comment to whatever we or our students post. What results is often a rich, multimedia conversation between instructors and students. In her book, Best Practices for Teaching with Emerging Technologies, Dr. Michelle Pacansky-Brock outlines how she regularly integrates VoiceThread into her Art History classes. For an example of how one might use VoiceThread, visit one of Dr. Pacansky-Brock’s real VoiceThreads. Online learning and assessment tools —Several online homework/learning tools are described under the Handling Student Grades tab above. In large courses, such interactive technologies can prove a critical resource for students who desire frequent feedback, but can’t afford to visit instructor office hours each week. Carbone, Elisa Lynn. Teaching Large Classes: Tools and Strategies. Thousand Oaks, CA: Sage Publications, c1998. Cooper, James L. and Pamela Robinson. “The Argument for Making Large Classes Seem Small.” New Directions for Teaching and Learning 81 (2000): 5-16. Renaud, Susan, Elizabeth Tannenbaum, and Phillip Stantial. “Student-Centered Teaching in Large Classes with Limited Resources.” English Teaching Forum Number 3 (2007). Stanley, Christine A. and M. Erin Porter. 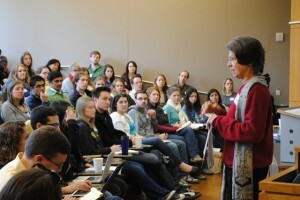 Engaging Large Classes: Strategies and Techniques for College Faculty. Boston: Anker Publishing Company, Inc., 2002. Angelo TA and Cross KP (1993). Classroom Assessment Techniques: A Handbook for College Teachers, 2nd edition. San Francisco: Jossey-Bass. Cooper JL and Robinson P (2000). The Argument for Making Large Classes Seem Small. New Directions for Teaching and Learning 81: 12. Crouch CH and Mazur E (2001). Peer instruction: Ten years of experience and results. American Journal of Physics 69: 970-977.